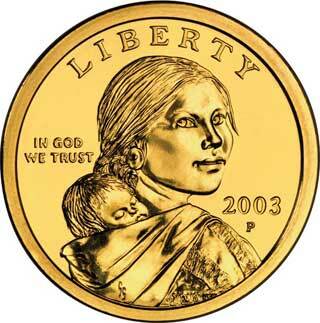 Face of Sacajawea golden dollar (source:Wikipedia; copyright restrictions unknown - published here under the principle of fair use (educational / nonprofit). Sacajawea (1788 - 1812) was a Shoshone woman who accompanied and assisted the Lewis and Clark Expedition in their exploration of the Western United States. Sacagawea died at the age of 25; her grave is located in Lander, Wyoming. Historical details about Sacajawea are extremely limited, but she has become a critical character of the Lewis and Clark expedition in the American public's imagination. In the early twentieth century, the National American Woman Suffrage Association adopted her as a symbol of women's worth and independence. 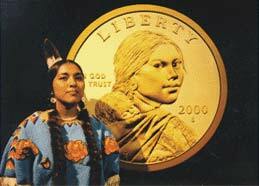 The Sacagawea golden dollar coin depicts Sacagawea and her son, Jean Baptiste. The face on the coin was modeled after Randy'L He-dow Teton (a modern Shoshone-Bannock woman). SAKAKAWEA historic marker notes the location of her death. Reverse of Sacajawea golden dollar - public domain image on Wikipedia. 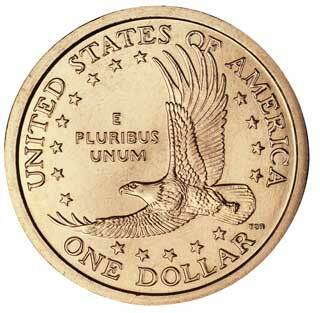 Randy'L He-dow Teton; model for the U.S. Sacagawea dollar coin; image was originally copied from Wikipedia's article on Sacajawea Dollar (where it was listed as public domain; the image is no longer available there).